Nonenhanced computed tomography (CT) scan in a 35-year-old woman with hypertension demonstrates a large, right-sided, inhomogeneous adrenal mass (white arrows) with a central area of low attenuation that represents hemorrhage or necrosis. The upper pole of the displaced right kidney can be seen (black arrow). Courtesy of Dr Ali Shirkhoda, William Beaumont Hospital, Michigan. 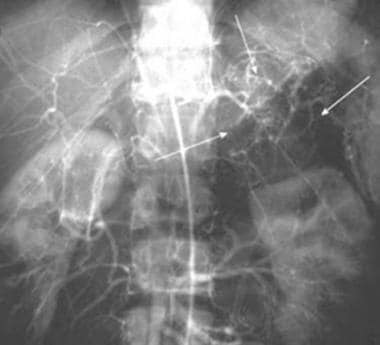 Axial gradient-recalled magnetic resonance angiogram in a 42-year-old woman with a 5-year history of hypertension who underwent magnetic resonance angiography for the assessment of renal arterial stenosis. Although the renal arteries were unremarkable, a 7.5-cm X 5-cm right adrenal mass was incidentally identified. 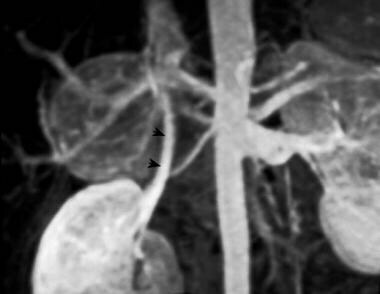 Angiogram demonstrates a large, right-sided, inhomogeneous adrenal mass (arrows). Courtesy of Dr Ali Shirkhoda, William Beaumont Hospital, Michigan. Detecting the tumors is important for a number of reasons. First, hypertension is usually cured with the removal of the tumor, whereas untreated patients are at risk for a lethal hypertensive paroxysm and long-term sequelae of the disease. Second, the discovery of a pheochromocytoma may indicate the presence of a familial disorder. Third, approximately 10% of pheochromocytomas are malignant. Incidentally, pheochromocytomas are called the 10% tumor because they are associated with a 10% risk of malignancy, because 10% of the tumors are bilateral, and because 10% of the tumors are extra-adrenal. Early detection may reduce the risk of metastasis. Usually, tumors are larger than 3 cm when seen. They are highly vascular (see the images below), and larger tumors are prone to hemorrhage and necrosis, even when they are benign. Selective adrenal angiogram demonstrates the highly vascular nature of a pheochromocytoma. Courtesy of Dr Ali Shirkhoda, William Beaumont Hospital, Michigan. Three-dimensional maximal-intensity magnetic resonance angiogram clearly demonstrates a large, hypervascular right adrenal mass. Arrowheads demarcate the right renal vein. Courtesy of Dr Ali Shirkhoda, William Beaumont Hospital, Michigan. Failure to make the correct diagnosis can create serious risks for the patient. Early surgical removal of the adrenal gland is important to prevent complications associated with pheochromocytomas. Delay can significantly increase the risk of an adverse event. 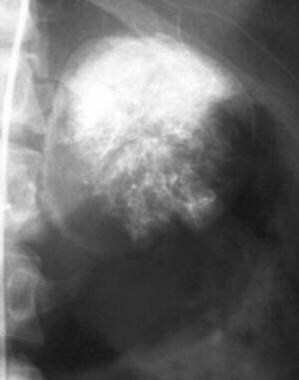 Worse, if pheochromocytoma is not considered in the diagnosis, the injection of contrast material, especially ionic contrast material, can provoke a hypertensive crisis. Therefore, exclusion of pheochromocytoma should be part of the diagnostic evaluation in every patient with a suprarenal mass. Some authors recommend 131I-MIBG scintigraphy and/or the use of laboratory tests to confirm or rule out excessive production of catecholamines, prior to the use of invasive procedures. CT scanning is quick and relatively inexpensive, and it offers good spatial localization. 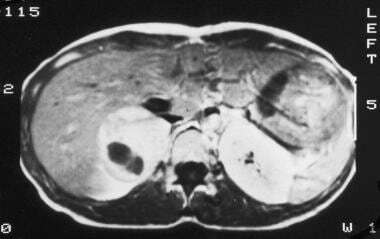 CT scan findings are not specific enough to distinguish masses caused by pheochromocytoma from other adrenal masses. Additionally, some authors report a risk of hypertensive crisis after the injection of contrast material. MRI is more specific for pheochromocytomas than is CT scanning, but some patients cannot tolerate MRI. In comparison with other available modalities, radiography has limited value. Large adrenal masses may compress and deform the upper pole of the kidney (as shown in the image below); these may be discovered incidentally on intravenous urograms. Abdominal aortogram in a patient with pheochromocytoma demonstrates a hypervascular mass (arrows) that flattens the upper pole of the left kidney. Courtesy of Dr Ali Shirkhoda, William Beaumont Hospital, Michigan. Late-phase contrast-enhanced computed tomography (CT) scan in a 22-year-old man with hypertension reveals an enlarged right adrenal gland with central necrosis. Courtesy of Dr Ali Shirkhoda, William Beaumont Hospital, Michigan. The adrenal gland on the right side is located directly posterior to the inferior vena cava (IVC), between the right crus of the diaphragm and the liver. The left adrenal gland is located more caudally and may be seen on the same imaging section that shows the kidney. On CT and axial MRI scans each gland is seen as a linear or inverted Y- or V-shaped organ located superior, medial, and anterior to each kidney. Note that neither CT scanning nor MRI can be used to distinguish between the adrenal cortex and the medulla. T1-weighted spin-echo magnetic resonance image (repetition time, 600 milliseconds; echo time, 15 milliseconds) in a 35-year-old woman with hypertension reveals a mixed isointense-to-hypointense right adrenal mass. Courtesy of Dr Ali Shirkhoda, William Beaumont Hospital, Michigan. 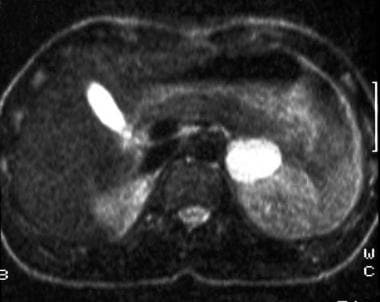 T2-weighted spin-echo magnetic resonance image (repetition time, 2000 milliseconds; echo time, 70 milliseconds) in a 35-year-old woman with hypertension (same patient as in the previous image) shows that the right adrenal tumor has high signal intensity, a feature typical of pheochromocytomas. Courtesy of Dr Ali Shirkhoda, William Beaumont Hospital, Michigan. T1-weighted gadolinium-enhanced magnetic resonance image (same patient as in the previous 2 images) shows a diffusely enhancing mass with a central area devoid of enhancement. Courtesy of Dr Ali Shirkhoda, William Beaumont Hospital, Michigan. T2-weighted spin-echo magnetic resonance image (repetition time, 1800 milliseconds; echo time, 90 milliseconds) in a 30-year-old man with hypertension reveals a hyperintense mass in the left adrenal gland that posteriorly displaces the kidney. Courtesy of Dr Ali Shirkhoda, William Beaumont Hospital, Michigan. A 45-year-old patient with a history of multiple endocrine neoplasia type 2A who underwent prior thyroidectomy and bilateral adrenalectomy 14 years previously was admitted to the hospital with elevated blood pressure. Performance of breath-hold T1-weighted fat-suppressed gradient-recalled echo magnetic resonance imaging (MRI) (repetition time, 4.5 milliseconds; echo time, 1.9 milliseconds; flip angle, 12°) revealed an inhomogeneous, hypointense mass (arrows) anterior to the aorta. Later, at surgery, the tumor was proven to be a recurrent extra-adrenal pheochromocytoma (paraganglioma). Courtesy of Dr Ali Shirkhoda, William Beaumont Hospital, Michigan. The use of flow-sensitive sequences is helpful in demonstrating the presence of intracaval extension of the tumor. On MRI scans obtained with gadolinium diethylenetriamine pentaacetic acid (DTPA), tumors demonstrate brisk and prolonged enhancement; however, contrast enhancement rarely provides additional information. Gadolinium-based contrast agents have been linked to the development of nephrogenic systemic fibrosis (NSF) or nephrogenic fibrosing dermopathy (NFD). The disease has occurred in patients with moderate to end-stage renal disease after being given a gadolinium-based contrast agent to enhance MRI or magnetic resonance angiography (MRA) scans. Characteristics include red or dark patches on the skin; burning, itching, swelling, hardening, and tightening of the skin; yellow spots on the whites of the eyes ;joint stiffness with trouble moving or straightening the arms, hands, legs, or feet; pain deep in the hip bones or ribs; and muscle weakness. Although pheochromocytomas typically have high signal intensity on T2-weighted images, this finding is not universal. In 20-33% of patients, T2-weighted images show atypical findings. 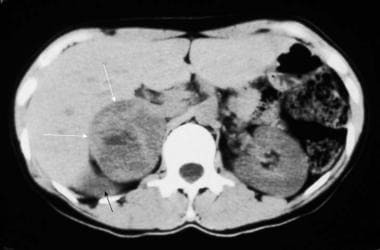 As a result, an alternate diagnosis of necrotic metastasis or adrenal cortical carcinomas may be made if this variance is not kept in mind. 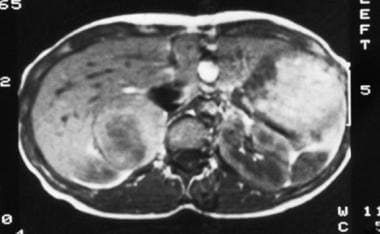 On the other hand, comparable high signal intensity may be seen in some necrotic adrenal metastases and adrenal cysts; as a result, these lesions cannot always be distinguished from pheochromocytomas on MRI scans. Ultrasonography has largely been replaced by CT scanning and MRI, and it is limited as a result of the effects of overlying bowel gas, especially in the assessment of the left adrenal gland. Therefore, the use of ultrasonography is limited to differentiating cystic lesions from solid lesions in the adrenal gland. Even in the pediatric population, MRI is the preferred imaging modality. Examples of an ultrasonographically identified adrenal mass are seen below. 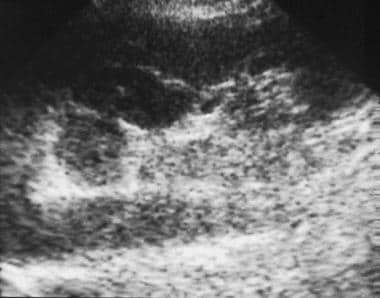 Ultrasonogram of an adrenal mass. Oblique sagittal image of the abdomen demonstrates an isoechoic mass of the left adrenal gland that is anterolateral to the aorta and medial to the left kidney. Courtesy of Dr Ali Shirkhoda, William Beaumont Hospital, Michigan. 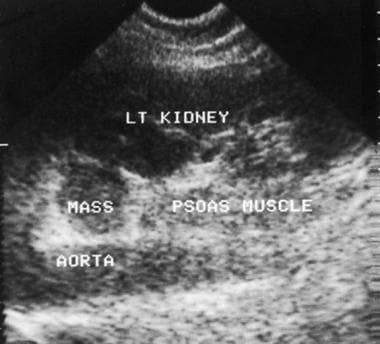 Ultrasonogram of an adrenal mass. Oblique sagittal image (same patient as in the previous image) of the abdomen demonstrates an isoechoic mass of the left adrenal gland that is anterolateral to the aorta and medial to the left kidney. Courtesy of Dr Ali Shirkhoda, William Beaumont Hospital, Michigan. A normal adrenal medulla is seen in approximately 30% of patients, with an uptake of less than that of the liver. In pheochromocytoma, iodine-131 metaiodobenzylguanidine (131I-MIBG) scans show the tumor as a focal area in the adrenal gland that has prolonged increased uptake. (Such a focal area is seen in the image below.) Tumor metastases can be demonstrated in a similar fashion. Compared with 131I-MIBG imaging, 123I-MIBG imaging offers better image quality, single-photon emission CT (SPECT) capability, lower radiation exposure, and shorter imaging time. Patient admitted to the hospital with hypertensive crisis. Confirmatory iodine-131 metaiodobenzylguanidine scanning had been performed. A posterior 24-hour scan reveals a focus of increased tracer uptake in the region of the right adrenal gland. Courtesy of Dr Ali Shirkhoda, William Beaumont Hospital, Michigan. Iodine-131 MIBG and 123I-MIBG are concentrated in the sympathomedullary system and then sequestered in neurosecretory granules. After pretreatment with Lugol iodine to saturate thyroid uptake, 0.5-1.0 mCi of 131I-MIBG or 9-10 mCi of 123I-MIBG is intravenously injected, and posterior adrenal images are obtained after 24, 48, and 72 hours. Technetium-99m DTPA also is used to improve localization of the kidneys. The use of FDG, a glucose analogue used by metabolically active cells, with PET scanning is described. In a study of 29 patients with benign and malignant pheochromocytomas, Shulkin and colleagues reported tumoral uptake of FDG in 22 patients. They noted that as many as 17 of the 29 patients had malignant pheochromocytoma, which may have resulted in this high degree of positivity. Reportedly, sensitivity is 86-90% for pheochromocytomas (especially in extra-abdominal tumors); specificity is as high as 99% with 131I-MIBG and is higher with 123I-MIBG (90% sensitivity, 100% specificity). 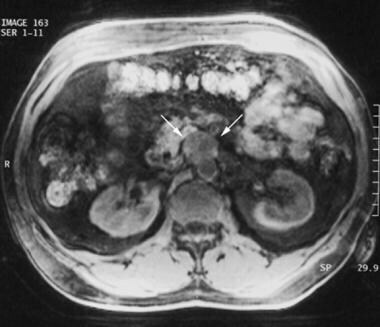 MIBG uptake may be poorly visualized in tumors, even large tumors, with extensive necrosis. Occasionally, activity in the bowel can create false-positive findings, especially when extra-adrenal tumors are considered. The study can be repeated 24 hours later, when activity in the gut is displaced. 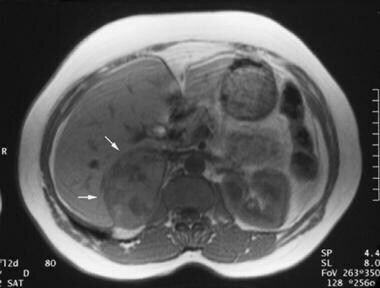 As a result of the 10% false-negative rate with MIBG scanning, some authors recommend abdominal CT scanning or MRI if a high clinical suspicion of pheochromocytoma exists but a causative tumor is not identified by assessing MIBG uptake. Angiography and venous sampling are no longer used because of the higher sensitivity and specificity of other available, and noninvasive, tests. In addition, angiography is hazardous without premedication, and a hypertensive crisis can result. If performed, angiograms show increased vascularity in the tumors. McDermott S, McCarthy CJ, Blake MA. Images of pheochromocytoma in adrenal glands. Gland Surg. 2015 Aug. 4 (4):350-8. [Medline]. Borhani AA, Hosseinzadeh K. Quantitative Versus Qualitative Methods in Evaluation of T2 Signal Intensity to Improve Accuracy in Diagnosis of Pheochromocytoma. AJR Am J Roentgenol. 2015 Aug. 205 (2):302-10. [Medline]. Francis IR, Korobkin M. Pheochromocytoma. Radiol Clin North Am. 1996 Nov. 34(6):1101-12. [Medline]. Raja A, Leung K, Stamm M, Girgis S, Low G. Multimodality imaging findings of pheochromocytoma with associated clinical and biochemical features in 53 patients with histologically confirmed tumors. AJR Am J Roentgenol. 2013 Oct. 201(4):825-33. [Medline]. Serter A, Alkan A, Aralasmak A, Kocakoc E. Severe posterior reversible encephalopathy in pheochromocytoma: importance of susceptibility-weighted MRI. Korean J Radiol. 2013 Sep. 14(5):849-53. [Medline]. [Full Text]. Lin M, Wong V, Yap J, Jin R, Leong P, Campbell P. FDG PET in the evaluation of phaeochromocytoma: a correlative study with MIBG scintigraphy and Ki-67 proliferative index. Clin Imaging. 2013 Sep 11. [Medline]. Hofman MS, Hicks RJ. Moving Beyond "Lumpology": PET/CT Imaging of Pheochromocytoma and Paraganglioma. Clin Cancer Res. 2015 Sep 1. 21 (17):3815-7. [Medline]. Sait S, Pandit-Taskar N, Modak S. Failure of MIBG scan to detect metastases in SDHB-mutated pediatric metastatic pheochromocytoma. Pediatr Blood Cancer. 2017 Apr 14. [Medline]. Nakamoto R, Nakamoto Y, Ishimori T, Togashi K. Clinical Significance of Quantitative 123I-MIBG SPECT/CT Analysis of Pheochromocytoma and Paraganglioma. Clin Nucl Med. 2016 Nov. 41 (11):e465-e472. [Medline]. Chang CA, Pattison DA, Tothill RW, Kong G, Akhurst TJ, Hicks RJ, et al. (68)Ga-DOTATATE and (18)F-FDG PET/CT in Paraganglioma and Pheochromocytoma: utility, patterns and heterogeneity. Cancer Imaging. 2016 Aug 17. 16 (1):22. [Medline]. Schieda N, Alrashed A, Flood TA, Samji K, Shabana W, McInnes MD. Comparison of Quantitative MRI and CT Washout Analysis for Differentiation of Adrenal Pheochromocytoma From Adrenal Adenoma. AJR Am J Roentgenol. 2016 Jun. 206 (6):1141-8. [Medline]. Timmers HJ, Chen CC, Carrasquillo JA, Whatley M, Ling A, Havekes B, et al. Comparison of 18F-Fluoro-L-DOPA, 18F-Fluoro-Deoxyglucose, and 18F-Fluorodopamine PET and 123I-MIBG Scintigraphy in the Localization of Pheochromocytoma and Paraganglioma. J Clin Endocrinol Metab. 2009 Oct 28. [Medline]. [Full Text]. Luster M, Karges W, Zeich K, Pauls S, Verburg FA, Dralle H, et al. 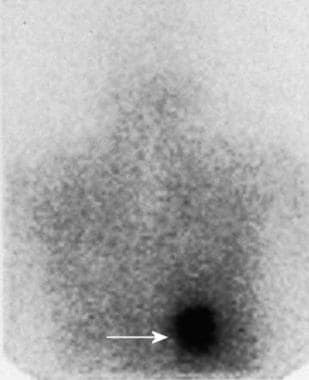 Clinical value of (18)F-fluorodihydroxyphenylalanine positron emission tomography/computed tomography ((18)F-DOPA PET/CT) for detecting pheochromocytoma. Eur J Nucl Med Mol Imaging. 2009 Oct 28. [Medline]. Gaertner FC, Wiedemann T, Yousefi BH, Lee M, Repokis I, Higuchi T, et al. Preclinical Evaluation of 18F-LMI1195 for In Vivo Imaging of Pheochromocytoma in the MENX Tumor Model. J Nucl Med. 2013 Oct 17. [Medline]. Saad FF, Kroiss A, Ahmad Z, Zanariah H, Lau W, Uprimny C, et al. Localization and prediction of malignant potential in recurrent pheochromocytoma/paraganglioma (PCC/PGL) using 18F-FDG PET/CT. Acta Radiol. 2013 Sep 14. [Medline]. Ilias I, Pacak K. Diagnosis, localization and treatment of pheochromocytoma in MEN 2 syndrome. Endocr Regul. 2009 Apr. 43(2):89-93. [Medline]. Shulkin BL, Thompson NW, Shapiro B. Pheochromocytomas: imaging with 2-[fluorine-18]fluoro-2-deoxy-D-glucose PET. Radiology. 1999 Jul. 212(1):35-41. [Medline]. [Full Text]. Yamamoto AJ, Zhuang H, Alavi A. Detection of cranial metastases by F-18 FDG positron emission tomography. Clin Nucl Med. 2001 May. 26(5):402-4. [Medline]. Freitas JE. Adrenal cortical and medullary imaging. Semin Nucl Med. 1995 Jul. 25(3):235-30. [Medline]. Shulkin BL, Koeppe RA, Francis IR. Pheochromocytomas that do not accumulate metaiodobenzylguanidine: localization with PET and administration of FDG. Radiology. 1993 Mar. 186(3):711-5. [Medline]. Recurrent malignant pheochromocytoma in a 70-year-old woman who underwent a right adrenalectomy for pheochromocytoma in 1975. 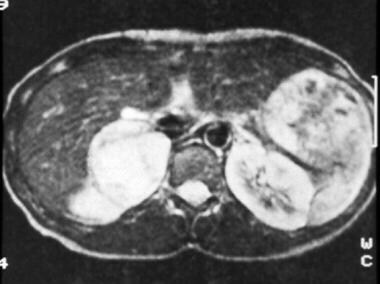 A T2-weighted spin-echo magnetic resonance image obtained in 1994 demonstrates a centrally hyperintense right-sided paraspinal mass (arrow), which was excised surgically and was proven to be a pheochromocytoma. Courtesy of Dr Ali Shirkhoda, William Beaumont Hospital, Michigan. Recurrent malignant pheochromocytoma in a 70-year-old woman who underwent right adrenalectomy for pheochromocytoma in 1975 (same patient as in the previous image). Follow-up magnetic resonance image obtained in 1998 reveals a recurrent mass in the aortocaval region, positioned above an atrophic right kidney. Inversion recovery image (repetition time, 5000 milliseconds; echo time, 76 milliseconds; inversion time, 150 milliseconds) demonstrates an aortocaval mass (arrow). A right nephrectomy and excision of the recurrent mass were performed. Courtesy of Dr Ali Shirkhoda, William Beaumont Hospital, Michigan. Recurrent malignant pheochromocytoma in a 70-year-old woman who underwent right adrenalectomy for pheochromocytoma in 1975 (same patient as in the previous 2 images). Follow-up sagittal inversion recovery fat-suppressed magnetic resonance image (repetition time, 5500 milliseconds; echo time, 76 milliseconds; inversion time 150 milliseconds) obtained in 1999 demonstrates an additional bilobed, hyperintense mass in the left periaortic region, which was believed to represent recurrence. Courtesy of Dr Ali Shirkhoda, William Beaumont Hospital, Michigan. Recurrent malignant pheochromocytoma in a 70-year-old woman who underwent right adrenalectomy for pheochromocytoma in 1975 (same patient as in the previous 3 images). 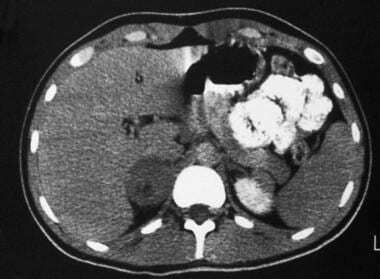 Follow-up computed tomography (CT) scans obtained in 2000 and a metaiodobenzylguanidine uptake scan (not shown) demonstrate a mass adjacent to the left renal vein (arrow). Courtesy of Dr Ali Shirkhoda, William Beaumont Hospital, Michigan. A 45-year-old patient with a history of multiple endocrine neoplasia type 2A who underwent prior thyroidectomy and bilateral adrenalectomy 14 years previously (same patient as in the previous image) was admitted to the hospital with elevated blood pressure. A gadolinium-enhanced gradient-recalled echo magnetic resonance image (repetition time, 4.5 milliseconds; echo time, 1.9 milliseconds) demonstrates peripheral enhancement of the mass (arrow). Courtesy of Dr Ali Shirkhoda, William Beaumont Hospital, Michigan. Inversion recovery fat-suppressed magnetic resonance image (repetition time, 5500 milliseconds; echo time, 76 milliseconds; inversion time, 150 milliseconds) reveals a large para-aortic mass, which is hyperintense. Courtesy of Dr Ali Shirkhoda, William Beaumont Hospital, Michigan.